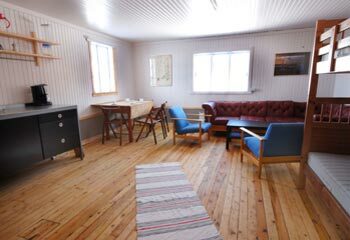 The Edvin cabin is available for rent within the period from May 1st till end of September. You rent the whole cabin, which is equipped with 6 bed places (included one double decker). Looking closer on the price list, you will notice that the price per night will become cheaper if you make your stay longer. If 6 persons are staying for a week, the price per night is only NOK 165,- per person. If 4 persons are staying for a week, the price per night is only NOK 248,- per person. Prices are in NOK and 12% VAT is included. To convert to your local currency see: XE.com - Personal Currency Assistant. Clean bed linnen and towels are included in the price and are handed out to the guests. When leaving the cabin, the guests have to vacuum clean the cabin and wash the dishes. send us an E-mail to Havhesten or call us on telephone no. (+47) 90 50 60 80.